I had NO idea what it was! caterpillar, no….fungus, no, ….disease, no! I couldn’t figure it out. We saved the mysterious object in the refrigerator and, off and on for weeks, we searched online trying to solve the mystery. Finally, during a fly fishing demo, we spoke with a Park Ranger, and she knew just what it was! It was an insect gall. Insect galls are growths that develop on plants. The plant reacts to a wound created by the insect. Apparently, a gall wasp, Callirhytis furva, will implant an egg into a leaf of an oak tree. 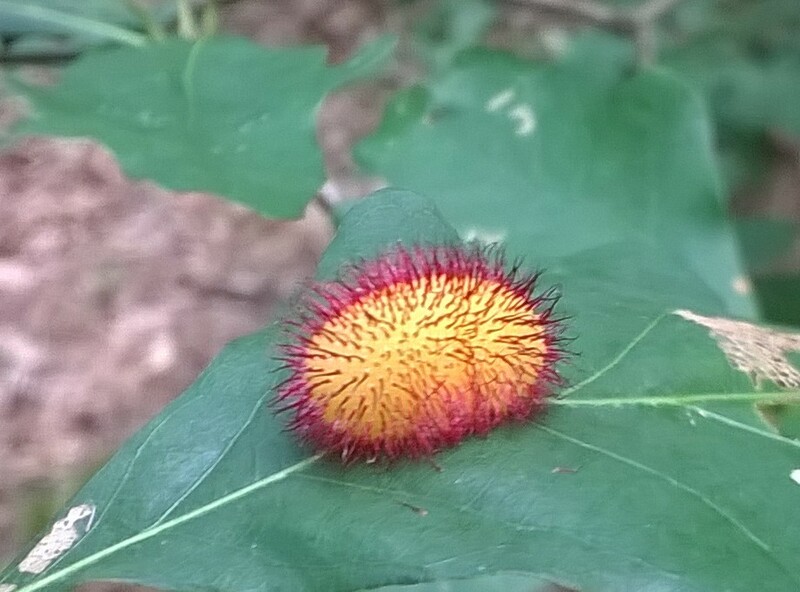 After the egg turns into a larva it will cause the oak tree to grow this pink and fuzzy gall on the leaf. The larva will then grow while it is protected by a hard, fuzzy gall covering. Isn’t that cool? My girls and I were incredibly excited about the search for information about this unknown object. I must admit that the search itself was even more exciting than finding out the answer! Go for a walk with the children that you know to look for galls and rear the insects at home. Encourage their questions as you all make discoveries! We had many more questions after our findings: What does a gall wasp look like? Does it have pink and yellow on its body? Do all oak trees make galls with that color combination? The questions are endless…and so are the answers! We hope that you enjoy the fall and have some exciting discoveries together! We would love to hear about your science adventures! Please feel free to comment. The vastness of science is inspiring, and the endeavor to unlock its mysteries can be its own reward. I love to hear people excited by it and share it with others. The importance of stimulating children’s minds is unmatched; they will be tomorrow’s scientists and engineers. Thank you for sharing our excitement so eloquently! We hope you join our VIP list via our web site to see how we’re stimulating future scientists’ minds. Welcome to Jumbo Minds! What is Pictured? Hoarfrost or Rime Ice?